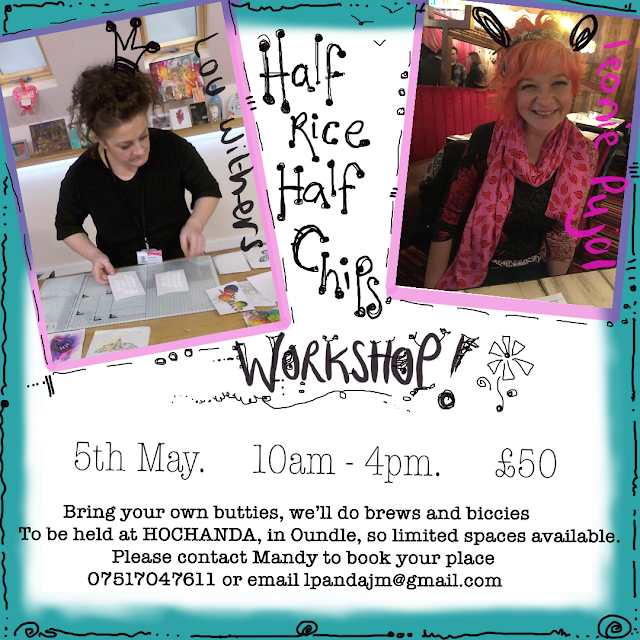 Hochanda workshop with Lou and Me!! So, today, we should have been celebrating my son, Jacob, 11th birthday. It often puts me in a quandary as to whether I should share this on public media, or keep things private. I really respect people who keep their private lives private, and question my reasons for making things public. However, yesterday at the craft show in Stevenage a lovely lady came over to see me who had lost her husband just a year ago. He used to drive her to the show, but this time she did it alone. The drive, the show and faced those overwhelming emotions. Which is such an achievement. Personally it meant a lot to me, as she told me she had watched me on tv and decided if I could smile and get on, then so could she. And in that moment I realised the potential of sharing - not just the good times, but the struggles, the hurt, and the loss. We all go through it, and if we can give a little comfort, inspiration or just a feeling of unity then that is a very positive outcome to something that has the potential to break us. So, here I am. I definitely don’t seek sympathy. I’m okay. I’m sad, and cry (a lot!! ), but I’m okay. This time the void Jacob left seems a little deeper, a little wider. It is accentuated because I am still grieving my sister, and her upcoming 40th birthday just breaks my heart. And of course, there’s always more to each story. The details which make grieving more complicated than it should be. All this said, I trundled downstairs with my dogs, Dylan smiling away even though his arthritis makes first thing in the morning a bit of a struggle. He made me smile. The day is looking beautiful. I’m going seeing my friend, and then have work from home, but it’s playing with graphic 45 (I know, work right!!). So, although the sadness lingers in my heart, it can be also be filled with gratitude, love and joy. To my readers, thank you. For those messages. For coming and seeing me at the shows and being so kind. But also, for sharing with me. It’s important isn’t it, after all, we’re in this together. And maybe that’s the most important reason I write this, to remind you you’re not alone, because sometimes it does feel that way doesn’t it. It’s going to be okay. Well folks, the end of the year is fast approaching, and we just have a couple of workshops remaining before we wrap them up for this year and prepare for the next. Next week we are going to be visiting Guildford again on Saturday. And then on Sunday we will be doing a split workshop with the very talented Anne Ruffles in Rottingdean. Well, okay, I need to write a little more than that!! I couldn’t post yesterday as my app refused to work. It’s still playing up, so I’m hoping this actually posts and doesn’t disappear into the ether. We arrived yesterday and hit the ground running. Which was perfect, as otherwise we would have all collapsed on bed and woke up at stupid o clock. Instead we went to a textile factory. The work is sensational. They are so talented. India is challenging - as we know - in that we see these amazing fabrics being printed and hand stitched. Months of work. For which the artists will receive very little. And then we here the customers are designer labels who sell them for a small fortune. The division of wealth in the world is sickening. But it is humbling. Everyone looked happy. They seem so chilled out. The kids loved us being there. Smiling, chatting and fearless. Obviously that was my perspection. The reality maybe very different. But it felt like an incredible privilege to be there. The sights are amazing. Driving around india is hilarious. But, when we had to cross the road, people do kinda stop. I say kinda. You have to take a leap of faith at times, but it’s mad yet fabulous. It looks manic, yet the feel is a certain calm. The beeping is okay. The pushing is fine. It’s all no problem. Block printing. Amazing. Loved it. The workers helped us out (although going “off piste” wasn’t the way!!). We then went to see the blocks being hand made, which again was mind blowing. We have a really inspirational group of people travelling with us as well. It’s so nice to be surrounded by so many interesting people, from so many different backgrounds. I’ve loved getting to know people and heading their stories. I’ll share some photos, but there’s so many, so I’ll have to wait until my blogger is working properly. Have a look on Facebook and Instagram, if you can, I’ll pop lots more on there over the 10 days. I knew I’d love India. So excited. Myself and my chum Jenny are being tour leaders on this incredible journey. We will be visiting villages which make the blocks, seeing the masters at work, and doing workshops to learn the skills. Plus so much more besides. I will pop photos on here, and let you know about our travels. Before then I’ve been to see my gorgeous little nephew, who’s such a wonderful little boy. And of course I’ve been working, which is brill. I’ll share a few photos. The workshops are all still all going ahead, we’ve got the next on in Guildford on the 17th, and then a joint workshop on the 18th, with the talented Anne Ruffles. That will be held in Rottingdean. Teaching Charlie the joy of paint!! Welcome to my blog. I am a craft presenter on television, a crafter, designer and Northerner! I now live in Peterborough, but my Lancashire accent stays strong. I have been in the craft industry for many years now, and love it. My career has allowed me to meet some wonderful, talented people, and I am constantly surrounded by inspiration. 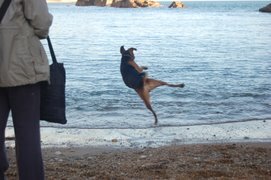 I am lucky to enjoy my career as it is also my hobby, however I also love getting out with my dogs, lovely holidays and a good book. When I work upstairs Dylan's favourite place is napping at the top of the stairs.